[L.A. Co. Arts Comm.] – The artmaking workshop originally scheduled at Vasquez Rocks Natural Area for June 16 and 17 was put hold because two active House Finch nests were found inside the construction site. The House Finches have now fledged their nests and the artmaking workshop is rescheduled for August 18-19 from 9 a.m. to 3 p.m. Weekend Workshops: August 18-19, 9:00 a.m.-3:00 p.m. both days at Vasquez Rocks Interpretive Center construction site, Agua Dulce, CA: full-scale construction of rammed earth project, participants can bring objects of their own to place in the rammed earth / time capsule. Bag lunch Noontime lectures by experts, August 18-19, 12:00 p.m., on local pre-history, ancient rock art and geology. The public is welcome to attend these, bring a bag lunch, see the progress of the sculpture as it is being constructed on-site and bring an artifact to drop into the rammed earth time-capsule. 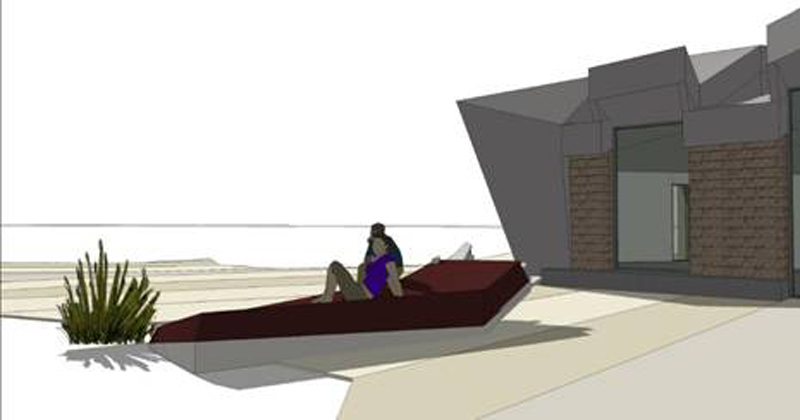 Rendering of new sculpture in front of new interpretive center at Vasquez Rocks by artists Oliver Hess and Jenna Didier. The Los Angeles County Arts Commission, Laura Zucker, Executive Director, provides leadership in cultural services of all disciplines for the largest county in the United States, encompassing 88 municipalities. In addition to overseeing the County’s Civic Art Program for capital projects, the Arts Commission provides leadership and staffing to support the County-wide collaboration for arts education, Arts for All; administers a grants program that funds more than 350 nonprofit arts organizations annually;; funds the largest arts internship program in the country in conjunction with the Getty Foundation; programs the John Anson Ford Theatres and supports the Los Angeles County Cultural Calendar on ExperienceLA.com and SpacefinderLA.org, Creative Spaces for Creative People. The Arts Commission also produces free community programs, including the L.A. County Holiday Celebration broadcast nationally, and a year-round music program that funds more than 120 free concerts and participatory arts events each year in public sites. The 2012-13 President of the Arts Commission is Mattie McFadden-Lawson. For more information please consult the Arts Commission online press kit: http://lacountyarts.org/page/pubnewspress.